Caption : Kolkata: The potato farmers and traders are reeling with crisis due to last year?s surplus production and lack of demand in export market. 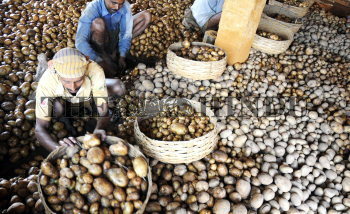 Third in global potato production, India at present produces 23.91 million tons of potato on 14,00,000 hectare land. West Bengal stands second in the country. According to the farmers, the low rainfall may not be beneficial for paddy, would be good for vegetables and potato production in the coming season. The recent setback in jute cultivation due to low rainfall with added burden of loss in potato crop, have confused them. Now the farmers in many pockets of West Bengal are thinking what could be the next crop? Photo: Arunangsu Roy Chowdhury August 24, 2010.